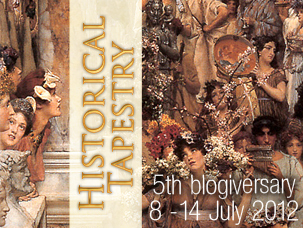 As part of the blogiversary celebrations, we are very excited to announce the start of a new feature here at Historical Tapestry! It's so new, we haven't quite managed to make a button for it yet, but that will come in due course! Thursday Threads will be a weekly meme where we look forward to hearing our readers thoughts on a different question each week! Some weeks we might ask you about favourite reads, favourite authors, favourite eras, recommendations or anything really! Every second week, we will be asking you to share a little something about the historical fiction you are reading now - where and when it is set? - and then different questions on the opposite weeks. What's your favourite HF read for this year so far? I have read quite a lot of good historical fiction this year, but the best book so far is definitely Legacy by Susan Kay. I had wanted to read this book for years, but I was a bit wary of reading it when I finally got hold of it because I thought I was all Tudored out! Even though I knew the story of Elizabeth I, the way this book was written kept my interest from beginning to end! I've read some great HF so far this year, but my absolute favorite is Doc by Mary Doria Russell. I have heard so many good things about Mary Doria Russell but never read her! I've read so many wonderful books, it's hard to choose. I really enjoyed Ann Chamberlin's The Woman at the Well, because she brought Syria in the time of Muhammad to life so wonderfully. I also really enjoyed Persia Wooley's Child of the Northern Spring, Heather Domin's Allegiance, and Rachel Pruitt's The Dragon's Harp. I haven't read any of those. In fact, I have only heard of the Woolley before! I've read quite a few good ones so far this year, too. My tops have been The Last Queen by C.W. Gortner and The Queen's Vow by C.W. Gortner. I do have Legacy and am hoping to get to the later this summer! I am a big fan of Gortner! I really hope you love Legacy when you do get to read it! "The Lost Souls of Angelkov" by Linda Holeman, about the serf emancipation in Russia. I do like a good novel set in Russia! Read quite a number of very good books. In the Company of the Courtesan was an excellent one set in Renaissance Italy by Sarah Dunant. I think that is my favourite Dunant. Must see if she had anything new coming out soon. Favorites so far are Enid Shomer's The Twelve Rooms of the Nile (it's not out yet, so this may not be fair!) and Beatriz Williams' Overseas. That's definitely not fair Sarah! Now I am going to go and see what I can find about it! I have Overseas out from the library at the moment to read! Two favourites - I can never boil down to one - C.W. Gortner's The Last Queen and Susanna Kearsley's Winter Sea. Great idea for a new feature!! Both great reads! We are big fans of Susanna Kearsley here at HT! I read Dorothy Dunnett's Lymond Chronicles earlier this year and loved all six books in the series. I can honestly say they are the best historical fiction novels I've ever read! I have been meaning to read Dorothy Dunnett for the longest time! I have heard so many great things about her books! One of these days I will get around to reading Wolf Hall. I have owned it since it first came out. Oh, I want to read that! So far my favourites are Bring Up the Bodies by Hilary Mantel, The Shoemaker's Wife by Adriana Trigiani and The Queen's Vow by C.W. Gortner. If my my current read, The King's Concubine by Anne O'Brien, continues to enthrall me it will most definitely make my list of favourites, too. Great idea for a weekly feature. I'm looking forward to participating. I really liked The Shoemaker's Wife too! I adored the interconnected, based-on-art stories in Katie Ward's "Girl Reading." Each piece was very different from each other, but all were fascinating. I also enjoyed "The Rebel Wife" by Taylor P. Polites. He made a post-Civil War narrative that could have been business as usually into something very different. In the YA segment, Katherine Longshore's "Gilt" is packaged like a cheap teen read, but it's the best view of Katherine Howard I've read since Plaidy. I had The Rebel Wife out from the library but had to take it back unread. My favorite so far has been 'Miss Lizzie's War' by Rosemary Agonito. That's a new title to me Kim! I haven't read much HF this year, only the two first books of Jean Auel's Earth's Children and Umberto Eco's The Name of the Rose. The last is one of my favourite readings of this year so far. I remember loving those first couple of Earth's Children books when I read them in my late teens! Not sure if they would stand up to a reread though! My favourite HF this year has to be The Help by Kathryn Stockett. I also ordered the video from Love Film and watched the film including all the snippets that didn't make the movie. There was also a great interview with the author and director. The book was a great read and I certainly recommend the film too! hm, I really liked Code Name Verity and Shadows Walking by Douglas Skopp. They were both awesome!! I REALLY need to read Code Name Verity! My favorites that I have read so far this year have been The Sister Queens by Sophie Perinot and The Flower Reader by Elizabeth Loupas. Both were wonderful reads! My Sister Queens does sound fascinating! I'd Have to say Empress Of The Seven Hills by Kate Quinn. She Vividly brings Ancient Rome to Life & her Characters( many who are based on actual people)are well-written & realistic. I can't wait to read her follow-up to this book! I haven't read Kate Quinn yet! I really liked The Stolen Crown: The Secret Marriage that Changed the Fate of England. (not sure of exact wording of the sub-title) by Susan Higginbotham. A close second is Four Sisters, All Queens by Sherry Jones. JoLene, I have enjoyed the other Susan Higginbotham books that I have read. Wow so many titles to look for. This new feature is definitely going to add quite a few books to my TBR pile!